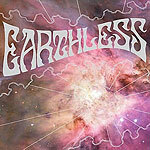 CD review: "Rhythms From a Cosmic Sky"
Psychedelic music forged from power riffs and the heaviest of the blues, the music of San Diego's Earthless sounds as if early incarnations of the Allman Brothers, Pink Floyd and Led Zeppelin got mixed up during a rehearsal session. The trio's first CD is a full-length outing, but only has three tracks. Of course, the first two songs are both about 21 minutes long, which pretty leads to the band being lumped in the "jam band" crowd. But the music here, while definitely psychedelic, is also harder edged than what most jam bands play. Guitarist Isiaiah Mitchell brings a definite metal edge to his playing, and while drummer Mario Rubalcaba (Rocket From the Crypt) and bassist Mike Eginton show a broad versatility on this album  roaming into punk, screamo and wholly uncharted rhythmic waters  they always seem to come back to the heavy blues that originally underpinned the first generation of metal bands. But even the most non-conforming of those early metal bands had all but abandoned the 20-minute jam by 1975 or so; this album is almost a re-imagining of what might have happened if metal hadn't hungered for commercial success, radio airplay and hits. It's a fun, sometimes mesmerizing listen  one that metalheads and guitar fans both are likely to dig.